It looks like there’s a bit of a focus on South Australia science-wise right now, which is fun. Ed Yong, writing from Britain, reports on some findings from the Uni of Adelaide, just down the road from me – don’t you just love the internet – about bone holes in dinosaurs and what they tell us about dinosaur activity [not to mention the activity of other land-dwelling mammals]. More specifically, the femurs of all dinosaurs, as well as all humans, all birds, all reptiles, every creature that actually has a femur, have holes in them called ‘nutrient foramina’. The hole allows an artery to pass through, supplying the bone with blood and oxygen. Roger Seymour, the principal scientist in the study, found [after looking at about a hundred animals] that the bigger the femur, the bigger the hole, but that mammals had holes about twice the size of similarly-sized reptiles. This has to do with metabolism, which has to do with activity – the lifestyle of the particular creature. Mammals are generally much more active than reptiles. However, monitor lizards, which chase down and kill prey, are an exception. Their foramina are on a par with mammals of similar size. The really interesting point of this study, though, is that it may be possible to infer much about a particular mammal or reptile’s lifestyle from the size of these holes. Especially in the case of extinct creatures whose behaviour we can’t observe directly. Seymour’s team examined the foramina of ten dinosaurs, and found that they were even larger for their size than those of mammals – suggesting a highly active lifestyle, fast growth, and a correspondingly hefty appetite. It’s an intriguing finding, because the lifestyles of these beasts, their diet and range, and whether or not they were warm-blooded, has long been a subject of debate. Seymour’s approach provides a way forward. His sample was quite small and localised, but there will probably be a lot of dinosaur-thigh-bone-hole-hunting on a world-wide scale in the near future. I first came across another development out of South Australia in, of all places, the Murdoch-owned Adelaide Advertiser. I later came across it on the Panda’s Thumb blog, written up by P Z Myers. He refers us to a more detailed description at Why Evolution is True. It’s all about a discovery of a number of preserved complex eyes, dating back 515 million years, and found at the Emu Shale in Kangaroo Island, only a couple of hours’ drive [and a bit of a swim] from here. Matthew Cobb reckons this shale compares pretty well with Canada’s Burgess Shale and Chenjiang in China. 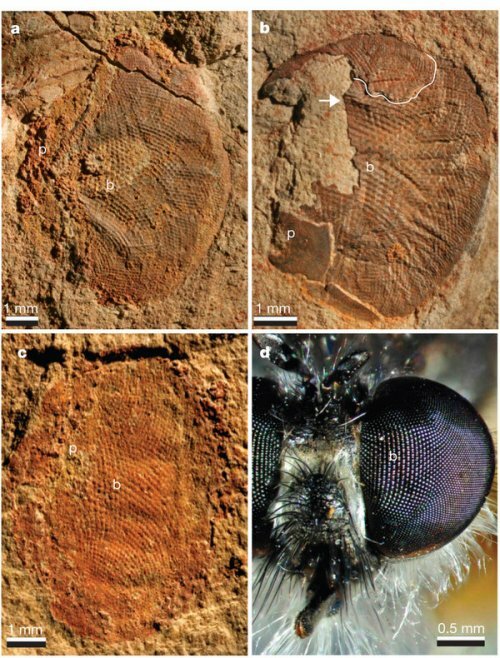 The dating puts these small compound eyes [about 7 millimetres long, with around 3000 individual lenses, called ommatidia] into the early Cambrian period, the first eyes of this type found before the Ordovician. Trilobites from the early Cambrian had highly developed eyes, but these eyes, believed to belong to an arthropod, possibly a bivalve arthropod species of Tuzoia, contain more ommatidia and are in other ways more complex. In fact, they bear comparison to modern complex eyes, as indicated by the photo of a modern species of fly, above. Apparently this has aerated the usual bunch of creationists who imagine that the existence of ‘fully-formed’ complex eyes in the Cambrian [aha! irreducible complexity!] is some kind of evidence against what they insist on calling Darwinism. This is just the usual cherry-picking of evidence. It’s hard to credit that these people trawl through the scientific research for anything that might confirm their fixation with fixity, while ignoring the masses of disconfirming evidence, but that’s just what they do. The point is that if a species evolves an effectively adapted visual apparatus, which it can do comparatively quickly, it seems, then that particular aspect of its evolution may not find an improvement, in that species or any other, for a long time. Natural selection still operates, but only in the negative sense, weeding out the maladaptive variants. Anyway, it’s an exciting story, from Kangaroo Island to the world. The third story isn’t about any new discovery, but it’s about a nearby underwater world that I only became vaguely aware of a few years ago, when the South Australian government was considering building a desal plant at the top of Spencer Gulf. 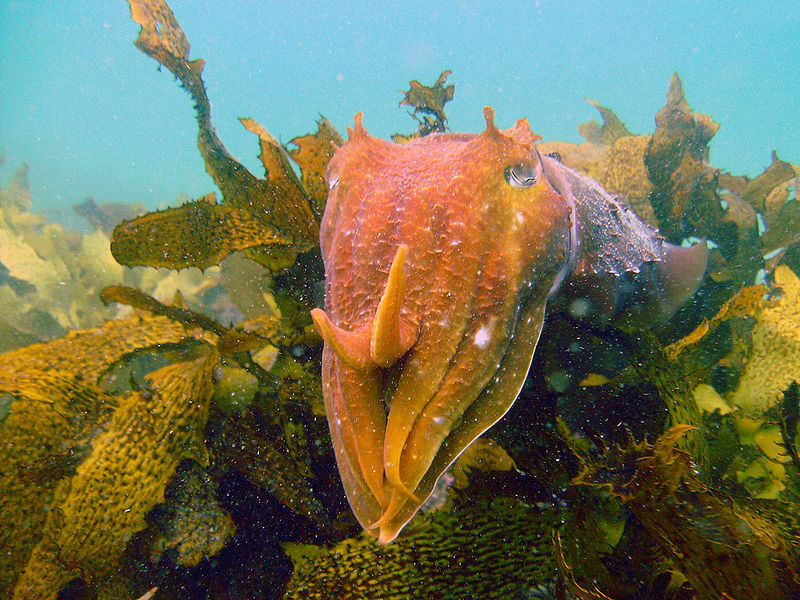 There was much talk of possible/probable disturbance to the unique breeding grounds of the Australian Giant Cuttlefish, Sepia apama, at Point Lowly, just north of Whyalla. Naturally I knew little about all this, but a recent documentary, about cuttlefish generally but with much focus on the particular species, the world’s largest, has certainly sparked my interest. These creatures are truly amazing. Up to a quarter of a million of them come to Point Lowly to breed and spawn, after which they quickly die off. The doco showed them sort of giving up the ghost, a particularly eerie and moving sight. They only live for about two years, though they’re complex and highly intelligent creatures. They have three hearts [which for all I know may be standard stuff for cephalopods] and they use chromatophore cells to put on amazing light displays, for various purposes such as camouflage, impressing potential mates and ‘hypnotising’ prey. Here’s an excellent vid of a cuttlefish camouflaging itself. The recent doco showed the cuttlefish briefly putting on its ‘flicker show’, a kind of strobe lighting effect, when a fake lobster was placed in its territory, but it soon realised it was being duped and switched off. Researchers such as Roger Hanlon have found that cuttlefish only have three different ‘camouflage templates’, which they’re able to manipulate to blend into just about any underwater environment. Obviously there’s still a lot to learn about these particular beasties. They can also change shape to look like rocks or to look like females [which are smaller and more non-descript looking than the males]. The males grow to around one metre, including tentacles. So if you’re a cuttlefish lover, this ain’t a bad place to be. I also note that there’s a cuttlefish fan club, based apparently in Singapore.